Early yesterday morning I went to the local Eveleigh Farmers' Market that's held every Saturday morning. 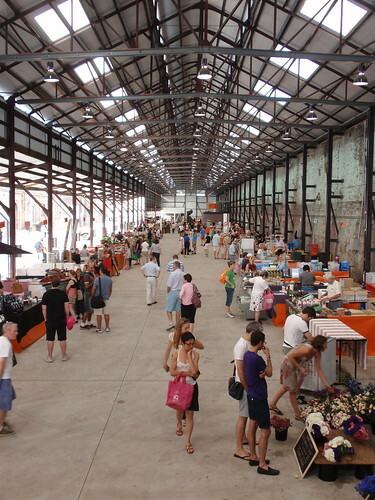 The market is set up in one of the large spaces that was formerly part of the Eveleigh Railway Workshop, but has recently been converted to the 'Carriageworks', a multi-purpose theatre, performance and events space. So I bought seasonal vegetables, some mixed varieties of mushrooms, my favourite bread, some fresh goat's cheese and a wonderful (though expensive) rack of lamb to share with my friend who's coming to stay this week. But I also bought two things that are rich in associations and have given me great pleasure today. 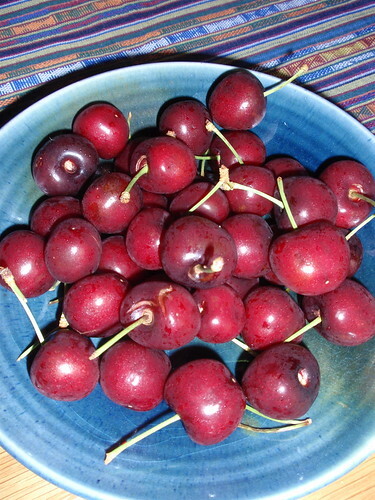 The farmer who was selling them said they'd come from Young - a town about 350km west of Sydney renowned for its cherries. It's the next door town to the one in which I grew up, where we had three cherry trees in my childhood garden. Each year as summer and Christmas approached, the cherries would ripen and the annual war with the birds over the fruit was waged. The methods were many and varied and included my mother's technique of taking random potshots at the birds with an air-rifle (dramatic but not particularly successful), tying bunches of silver streamers to the branches (pretty but not particularly successful), or my father's more successful, though much less picturesque method of wreathing the whole tree in netting. The cherry season is short, and picking cherries is tedious, so they were much valued and greatly enjoyed. And they're deeply part of my Christmas. I can't bring myself to buy imported out-of-season cherries. They not only incur innumerable airmiles to get here from California, but they somehow seem deeply 'unnatural'. The particular pleasure of cherries is that they are available just now, and will no longer be available in a month's time. They're definitely not a part of my childhood Christmases, but more recently I've been buying them when I celebrate Christmas in Sydney. 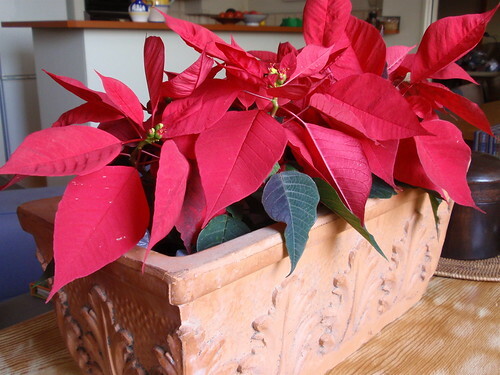 They seem to me to be a good compromise between traditional Christmas colours and foliage and celebrating Christmas in summer. And they're so bright. Instant Christmas cheer. Today I took the train to work. As work is only one stop from home on the trainline, it's much of a muchness in terms of time whether I walk to work or take the train. The deciding factor is usually the weather. As it gets hot and sunny I usually take the train to avoid the sun - I'll do almost anything to avoid the sun. Over the last few weeks there's been quite a few railway guards checking tickets at the station exit - the Devonshire Street exit from Central Station, which is the most convenient stop for a lot of tertiary education institutions - UTS, Sydney TAFE, and many private colleges. Invariably, I see the guards stopping people I assess to be international students - young, carrying backpacks or bags, almost always of Chinese or South Asian background. My initial response was to be angry at the guards for what seemed like their casual racism. But once I'd stopped to think, what I'm actually angry at is an example of real systemic discrimination. Except for the small group of exchange students, international students studying at tertiary institutions in New South Wales are not eligible for student travel concessions, though they are in all other states except Victoria. Some people (clearly including the NSW government) think they should not be eligible as they are not Australian citizens or permanent residents. However, many international students do work while they study and consequently pay Australian taxes, and all of them are paying fees of around $20,000 or more a year (that include a GST component) that cross-subsidise the university or TAFE education of local Australian students. Under the Howard Liberal government, federal funding to higher education was drastically reduced over time and universities looked to other sources of income - principally the recruitment of international students. As Australian students pay significantly less in fees than the real cost of their study, the fees paid by international students have gradually become a significant source of funding for basic infrastructure and teaching that benefit both local and international students. I regard education as a public good and I'm certainly not arguing that Australian students should pay more, but it seems unjust to me that fees from students from developing countries such as China, India, Pakistan and even Bangladesh pay for the education of local students in a wealthy, developed economy. I guess this is just one of the many absurd outcomes of expecting market forces to find solutions to matters of public benefit. So, back to the students being stopped by the guards at Central Station. Maybe they have invalidly claimed a student concession for their travel, or perhaps even tried to avoid payment altogether. I know that a belief in the unfairness of a law or rule is usually (though not always) no justification for flouting the law, but in this particular instance I would feel very hard done by if I were an international student. On the one hand they pay fees and taxes that support local students, and on the other hand they are not treated equitably. International students, and student associations more broadly, have been protesting against the stupidity and injustice of the present system for years, but without a satisfactory outcome. International students don't have a vote, but maybe those of us who do should make this an issue in the next state election. I imagine knitting would be a rich field of study for any psychologist investigating motivation. I'm interested in how individual projects create their own milestones or small goals that keep you knitting. 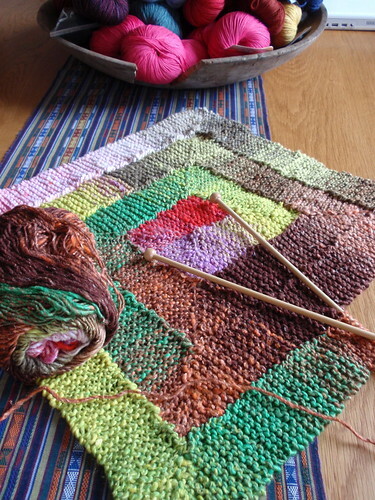 The blanket I'm knitting from Noro Taiyo is the nth degree in motivated knitting. 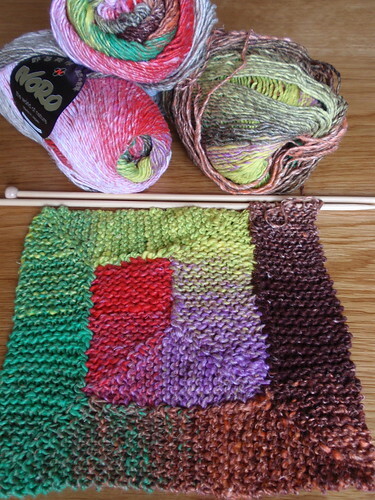 With colour-changing Noro yarns there's always the 'I'll just knit till the next colour' factor, but this blanket has the added goal of 'I'll just knit till the next corner'. As the blanket gets bigger, the next corner takes longer and longer to reach, but it certainly results in motivated knitting. I really like the composition and texture of the Taiyo, but as often happens with Noro, I'm very grumpy about the knots and joins in the yarn. It's relatively easy to spit-splice with Noro so the joins themselves are not disastrous - what's problematic is the very disjointed colour jumps at the joins that disrupt the colour sequences. I'm finding myself having to break the yarn in other places to reconstruct colour sequences that are reasonably balanced. There are other subtler motivations in knitting. 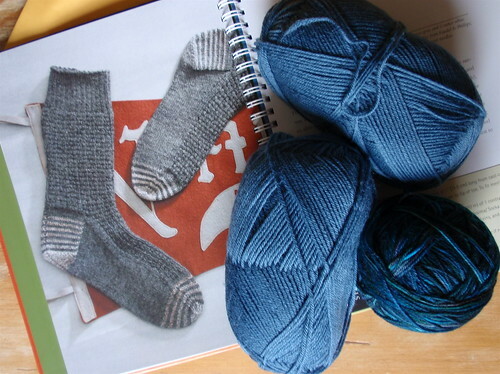 I think socks make for a perfectly staged knitting project with lots of intermediate goals: the cuff, the leg, turning the heel, the foot, the toe, (or the reverse for toe-up), and then repeat for the second sock. 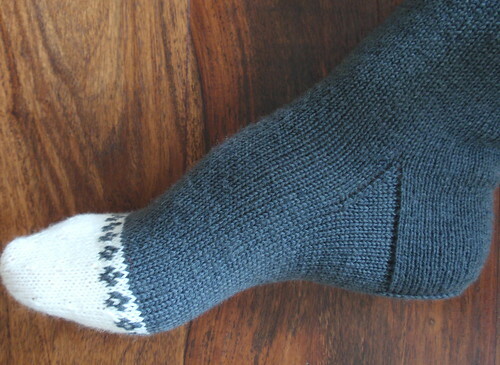 I'm currently knitting a vintage-style Nancy Bush sock (Gentleman's Sock in Railway Stitch) and it has the added motivation of a six-row repeat pattern - 'I'll just finish another pattern repeat'. With my rather awkward knitting style this is slow knitting. (I was taught to knit by my father many years ago. He was not a particularly skilled knitter, but he was very patient.) But I'm very happy so far with the outcome, and it doesn't matter if it takes some time. 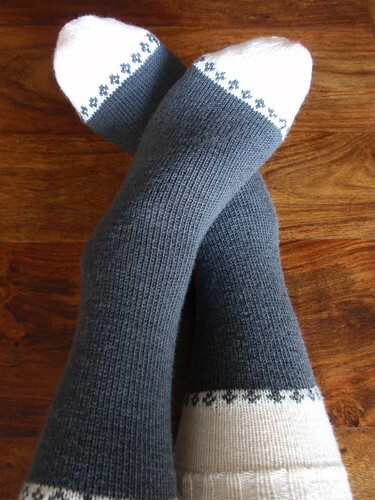 I love the fussily detailed, but ultimately streamlined socks that many vintage patterns produce. Completing the sixth pair of socks for my 2009 Personal Sock Club - sort of on time - has given me a great sense of accomplishment. I've called them my comfort socks, partly because they've been comfort knitting - a straight-forward project in stocking stitch with the very minor embellishment of a little colour work (well, grey and cream work) below the cuffs and around the toes. I'd forgotten how easy, quick and comfortable it is to knit plain stocking stitch socks. They're also comfort socks because they're knitted in Patonyl - plain, sufficiently soft, indestructible Patonyl. Very quiet and unassuming. Patonyl on 2.25m needles gives a neat, robust fabric. Basically they're a pattern from my sock knitting hero, Nancy Bush. She calls them 'Welsh Country Stockings' (ravlink) and includes them in her book, 'Folk Socks'. However, I used the decorative adaptations suggested by the super-stylish Mustaa Villaa and omitted the contrasting colour for the heels, but added the simple colour work motifs to the toes. Otherwise I knitted the pattern as directed. I love the round toes that Nancy Bush uses for these socks, and it was my first attempt at a Dutch heel, which looks a bit odd when the sock is off the foot but fits neatly and snugly when worn. I was aiming for 7 pairs of socks for my 2009 Personal Sock Club. Only one more pair to finish! So, I opened my final manilla envelope to reveal...yet more Patonyl! 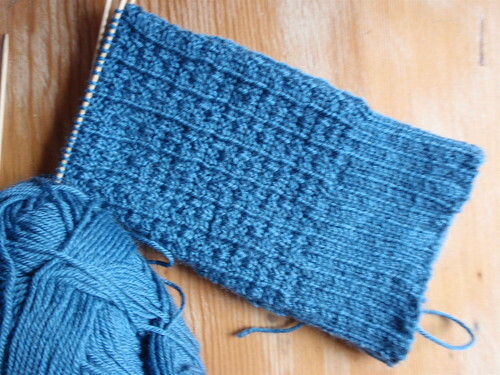 This time the yarn is a rather lovely, practical slatey blue-grey. I'm going to do yet more Nancy Bush - this time the Gentleman's Sock in Railway Stitch (ravlink) from 'Knitting Vintage Socks'. The pattern as written includes striped heels and toes so for the stripes I'm going to use up the last remains of some hand-dyed Patonyl that was a gift from Sonia as part of a long-ago swap. I'd intended to begin my last 2009 PSC socks this past weekend but, as seems almost inevitable with knitting, I've been distracted. On Saturday morning we had the monthly meeting of the Inner-City branch of the NSW Knitters' Guild. A great meeting, by the way. As Chair, Kris has a superb capacity to combine friendliness, inclusiveness and informality with an ability to move the agenda along. Lots of opportunities for chat, sharing of projects - some of them breath-taking this month - and learning. But I'm distracted yet again...this month, Michele Hartrick of Abundance Colour & Inspiration attended with some yarns for sale after the Guild branch meeting. I was seduced by skeins of Noro Taiyo, which I'd not seen before. As always with Noro, the delightful unexpectedness of the colour combinations was enticing. The Taiyo is a worsted-weight combination of cotton, silk, wool and nylon, so it has none of the scatchiness of many of the Noro predominantly woollen mixes, and while it is a single ply with thick and thin-ness, it doesn't drift apart as some of the other Noro yarns have a tendency to do. Did I mention the colours? Gorgeous. I spent quite a bit of time on Saturday looking for suitable patterns and decided on making a blanket - probably to give to the dotee. After a couple of false choices and even a false start I'm making Frankie Brown's 'Ten Stitch Blanket' (ravlink) which is loosely based on Elizabeth Zimmermann's baby blanket in the 'Opinionated Knitter, with its wide L-shaped strips of garter stitch. Such a wonderfully lairy project! This morning at the railway station I found myself in a ticket queue behind a trendy young man. Tall, fashionably thin, wearing skinny jeans, a fitted open-necked shirt and a hand-knitted vest. (I had my camera in my hand-bag but I didn't have the courage to ask if I could take a photograph - now I'm regretting my cowardice). The vest was standard vest shape in fair isle - an oatmealy grey background with shades of blue and maroon for the relatively simple, but beautiful pattern. I admired his vest and asked him how he'd acquired it. He said a friend had given it to him as a gift. 'She knows the designer' he said, 'and had it made for me as a one-off. It's exclusive'. So...from now on this is the response I'll use when someone comments on one of my hand-knits - though maybe you need to be tall and thin to really pull it off. So, the scarf I began as a consolation for the disappointment of my failed relationship with 'Henry' is finished. And I'm very happy with this new short but pleasurable association. It's been a delight to knit; a simple scarf recipe with two-by-two ribbing and big cables that results in a comfortable, reversible scarf. 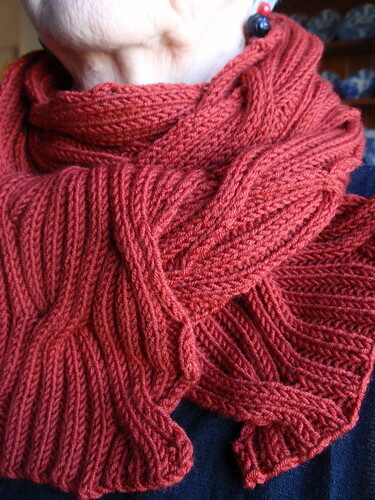 It's long enough to be whirled around the neck several times, or doubled with the ends pulled through the loop. Despite my best, very amateurish photographic endeavours, these pics don't really capture the richness of the colour, which is an intense brick-red. My previous blog post about beginning this project is a much better, though still not perfect, representation of the colour. I realised only today (sometimes I'm rather slow) that the time of day at which I take photographs makes a huge difference to the accuracy of the colours. But I'm not often home around mid-day, which is when the light is best. The scarf is a Christmas present, though I've decided I'll have to buy something to accompany it. I can't quite reconcile myself to giving a gift that can't be used for several months. Buried deep in my personal gift-giving protocols is an idea that presents shouldn't require a capacity for delayed gratification on the part of the recipient. I'm a bit surprised that I've knitted a Christmas present - it wasn't really part of my knitting schedule for the year. But I've enjoyed this, so I might try another. 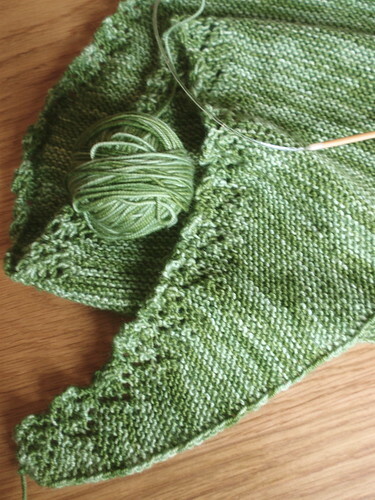 I'm about two-thirds of the way through Evelyn Clark's 'Wildflower Lace Scarf', but I've lost confidence in it. I admire Evelyn Clark's lace patterns, and I like everything about the yarn I'm using - its softness, its texture and its colour. It's Blue Moon Fiber Arts Socks That Rock sock yarn in the aptly named Jade. I'm trying to decide whether I should persist with it, or unravel it. I'm not expecting any advice, and won't undertake to follow any advice I receive, but feel free to comment if you're so inclined. * Normally I like patterns that bring together unexpected elements, and I really thought I'd like the regular geometry of the garter stitch combined with the daisy-patterned lace edge. But I'm really not sure it works. * Maybe the contrast of the lace and garter stitch would work without the added busyness of the variegated colours in the yarn. Maybe this pattern needs a solid colour? 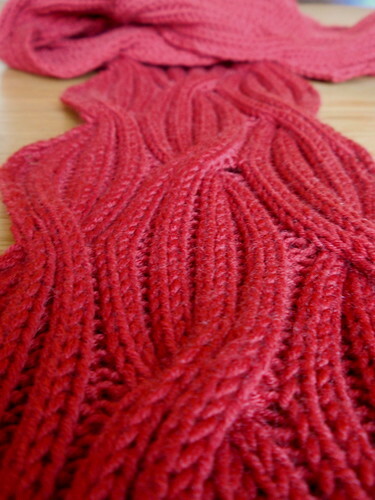 * The straight edge of the scarf has a purlwise slipped stitch to make a chained edging. I've found it impossible to keep the tension of the slipped stitch really even so the resulting edge doesn't have the neatness I would like. * Because I've knitted this in fits and starts I think the tension of my garter stitch isn't absolutely even, and garter stitch is really only beautiful if it's very even. * I'm not sure I have enough yarn to finish it! On the other hand, maybe blocking will remedy the slipped stitch edging and tension problems. It will certainly show the daisy edging to greater advantage. 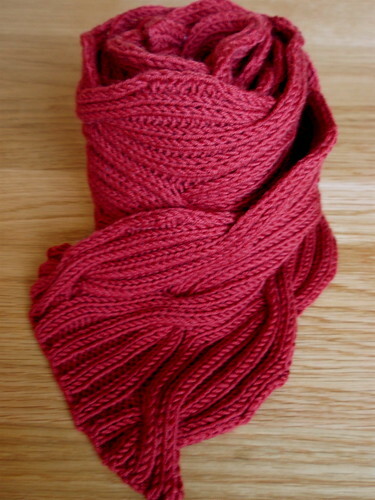 I weighed the yarn so that I would start my decreases at the right stage, so I should have enough yarn to complete it. If the scarf blocks well and if I have enough yarn I'll be left only with doubts about the design - and I might change my mind about that when I see it finished. With the arrival of warmer weather my living room windows are often open and in the evenings the scent of jasmine wafts through the windows. Several years ago someone (the Sydney City Council? my building's volunteer gardening team? the gardeners from the Australian Technology Park across the street?) 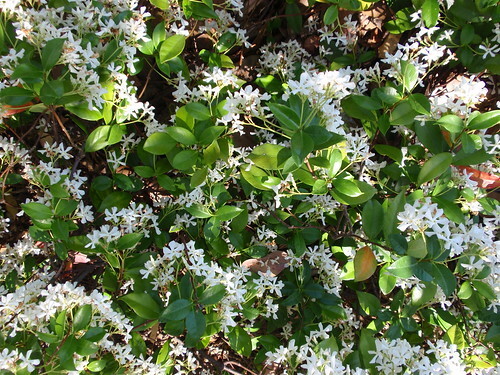 planted jasmine in the previously barren, litter-strewn street-side garden below my windows. The garden is now covered in a deep green creeper throughout the year and in Spring, is studded with starry white beautifully scented flowers. Even if the Sydney City Council gardeners aren't responsible for the delight the jasmine gives me, they have excelled themselves in other ways this Spring. 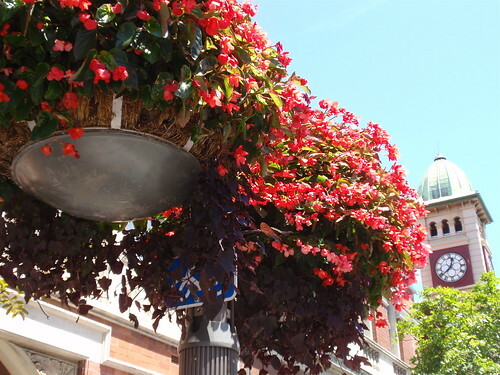 In one of the local main streets they've hung baskets filled with brilliant red begonias from the lamp-posts. They make me smile every time I see them. In the centre of the city itself I happened upon this garden in Martin Place. Big square pots have been massed together and densely planted with a mixture of marigolds, white petunias, some spiky leafed plant with small ball-shaped yellow flowers (an Australian native plant? do you gardeners out there know?) and parsley. 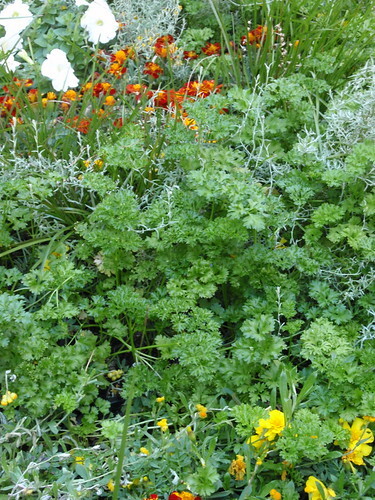 Yes, masses and masses of parsley! In this case the unexpectedness of the combination made me smile. And finally, some jacarandas; an introduction to summer. 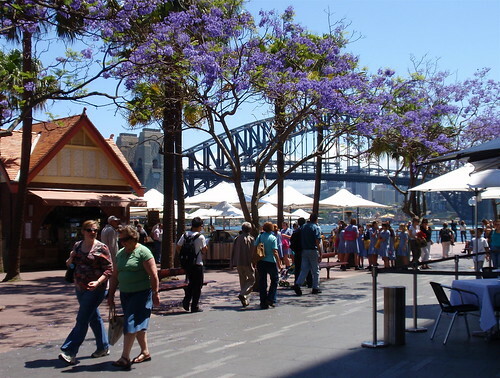 These are not particularly spectacular examples of jacarandas in bloom, but I think the background of the Sydney Harbour Bridge makes them irresistible. I imagine these trees must significantly pre-date the current crop of Sydney City Council gardeners, but they do protect and nurture the trees. The results of other people's gardening continue to delight me - and I feel particularly fortunate that my local council delivers me this delight. A couple of weeks ago a friend suggested I should visit a new gallery of contemporary Chinese art in my next door suburb - Chippendale. She's someone whose judgment I trust and she seemed particularly enthusiastic, so today a friend and I went to see the White Rabbit. I'm not sure what I'd imagined - maybe a small 'alternative' gallery space with some interesting but rather inscrutable works. But the White Rabbit is nothing like that. It's a very beautiful four storey gallery in a spacious, superbly renovated, luminous, former knitting factory. The exhibition is part of what must be an unrivalled personal collection by Judith Neilson of examples of Chinese art since 2000 across a range of media - paintings, sculpture, installations, video, and textiles. Much of it is political, either in the more obvious sense of commenting on the recent history or present changes in China, or personally political in commenting on gender and exploration of the body. Many of the pieces are immense and a great deal of it is confrontational. Li Linying, an abstract painter, began knitting strawberries on a whim with some left-over red and green wool. The pastime became a passion: eight years later she had 1,500 strawberries. 'They are like my children', she says, 'I worry about them'. Other textile works - there are some delicate, neat, black wool embroideries on white cotton by Gu Fan (the cover of the 'Guide Look' in the photo above depicts one of them), and my favourite piece in the exhibition: about 20 very delicate little girl dresses in fine silk organza suspended on fine lines from the ceiling and wafting gently in the air movements. The title of the piece by Jin Nu - 'Where Have All the Children Gone?' 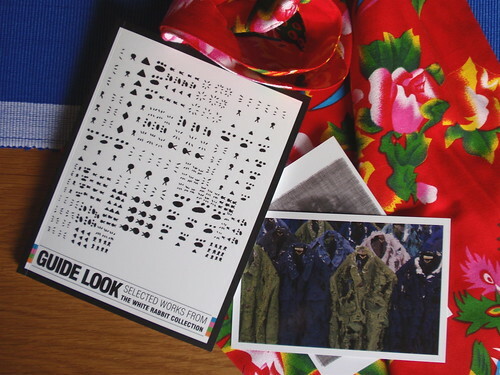 - transforms your admiration of the delicacy of the fabrics and their movement to awareness (sadness?) of all the unborn children, particularly girl children, resulting from China's 'one child' policy. Anyway - go visit the White Rabbit in Chippendale. It's free, beautiful and has art you might like to know about. There's an elegantly simple tea shop with a range of teas and tiny snacks beautifully presented - and very reasonably priced. And there's a gift shop with a small range of covetable gifts, such as the typically Chinese floral patterned fabric made up into carry bags in my photo. I actually didn't buy my bag. It was a gift from the owner of the gallery because they'd run out of biscuits in the tea shop. That's the kind of place it is!